Yasai Seikatsu series are one of the most famous vegetable juice, you can easily get these at convenience stores or supermarkets. 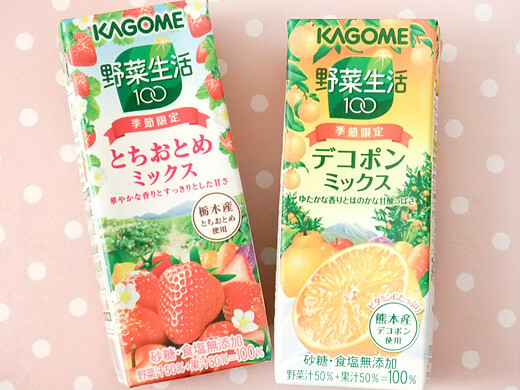 Their early spring limited flavors are Dekopon-Mix (citrus from Kumamoto Prefecture) and Tochiotome-Mix (strawberry from Tochigi Prefecture), both of these are good. 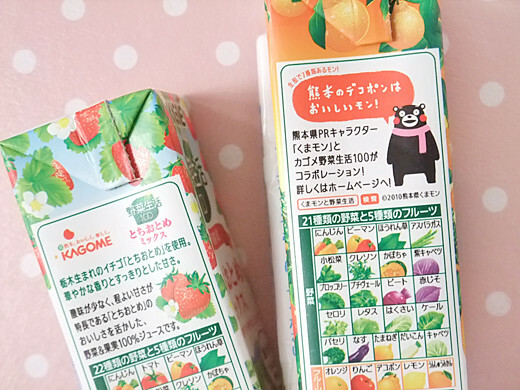 You’ll find Kumamon is talking to us like “Dekopon from Kumamoto Prefecture is yummy!” on the side of Dekopon-Mix juice package.